Everybody has heard of free radicals and antioxidants, but very few people have a clear understanding what these actually are and what effect they have on our health and the process of ageing. 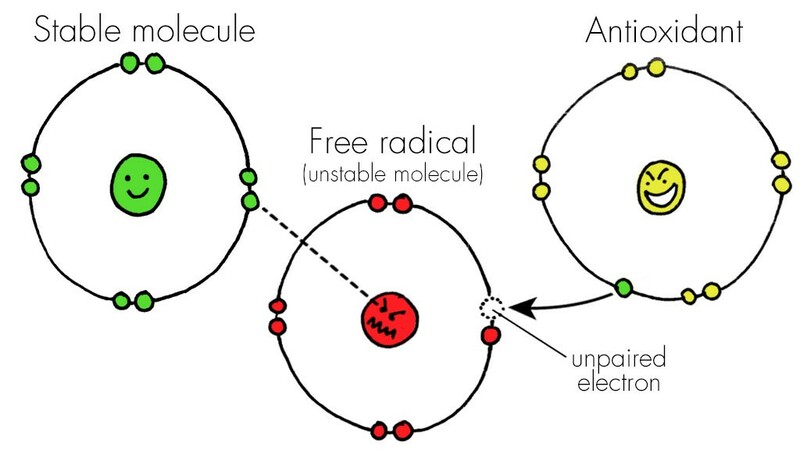 Free radicals are the molecules that are missing one electron. The ions of the air, water or other substances that consist of such molecules are positively charged. Once they get into our blood stream through the lungs and then through the blood circulation, they behave like “vampires”, trying to steal a free electron to compensate for the missing one that they lack. And they steal it from our defenceless cells. As a result, the cells loose moisture (hyaluronic acid). This stimulates ageing. The moisture is being suckout out of the cells by free radicals like with a pump. Antioxidants, on the contrary, are the molecules that have an extra electron. A concentration of such molecules makes the air or water or skin products live and fresh. In nature, such air can be found in the mountains, near the coast, in the woods, etc. The negatively charged ions are very mobile. Once they get in contact with the lungs, they travel to the cells of the body and "donate" a free electron to them. They behave like “donors”. Not only they neutralise free radicals that way, but also have rejuvenating effect on us. That is why, at Body Silk Clinic, during our facials and body treatments, such as LPG non-invasive facelift, prescribed facial and Endermologie treatment combined with an ultrasound booster, we use products that stimulate antioxidant activity. During your consultation. you will also get a nutrition advise to help your body detox and rejuvenate while undergoing a course of treatments. If you are interested to find out more about skin rejuvenation treatments, book your consultation with one of our consultants today or read other articles in our blog. If you found this post useful, please do let us know by rating it! Please, write your questions, if any, in the Comments section or contact us privately. Love Is In The Air - Gift Vouchers For Valentine's Day! Get Your Skin Ready For Christmas And New Year!